Ahora puedes escuchar y aprender la canción "Alley oop" de The Hollywood Argyles. 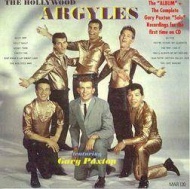 Alley oopthe hollywood argyles (really just gary paxton with a multi-track solo) he created the name "the hollywood argyles" since he was already under contract to another label as "flip" of "skip and ;words and music by dallas frazier, based on the comic strip. (peak billboard position #1 in 1960)simultaneous competing version by dante and the evergreens hit only # in (parentheses) sung by backup group only(alley oop, oop, oop-oop)(alley oop, oop, oop-oop)theres a man in the funny papers we all know (alley oop, oop, oop-oop)he lived 'way back a long time ago (alley oop, oop, oop-oop)he dont eat nothin' but a bear cat stew (alley oop, oop, oop-oop)well this cat's name is-a alley oop (alley oop, oop, oop-oop)he got a chauffeur that's a genuwine dinosawruh (alley oop, oop, oop-oop)and he can knuckle your head before you count to fawruh (alley oop, oop, oop-oop)he got a big ugly club and a head fulla hairuh (alley oop, oop, oop-oop)like great big lions and grizzly bearuhs (alley oop, oop, oop-oop)(alley oop) he's the toughest man there is alive (alley oop) wearin' clothes from a wildcat's hide (alley oop) he's the king of the jungle jive(look at that cave man go!!) (scream)he rides thru the jungle tearin' limbs offa trees (alley oop, oop, oop-oop)knockin' great big monstahs dead on their knees (alley oop, oop, oop-oop)the cats don't bug him cuz they know bettah (alley oop, oop, oop-oop)cuz he's a mean motah scootah and a bad go-gettah (alley oop, oop, oop-oop)(alley oop) he's the toughest man there is alive (alley oop) wearin' clothes from a wildcat's hide (alley oop) he's the king of the jungle jive(look at that cave man go!!) (scream)<spoken>thair he goes, look at that cave man gohe sure is hip ain't he?like what's happening?he's too muchride, daddy, ridehi-yo dinosawruhride, daddy, rideget 'em, manlike--hipsville. Escuchar The Hollywood Argyles Alley oop Lyric Video.